Littlehampton Book Services Ltd. Hardcover. POOR. Noticeably used book. Heavy wear to cover. Pages contain marginal notes, underlining, and or highlighting. Possible ex library copy, with all the markings/stickers of that library. Accessories such as CD, codes, toys, and dust jackets may not be included. Littlehampton Book Services Ltd. Hardcover. 0600380408 Good Condition. Gift inscription inside cover. Five star seller - Buy with confidence! . Good. A Ridge Press Book, Kein Erscheinungsdatum. Leineneinband mit farbigem Schutzumschlag. 251 Seiten, guter Zustand. London: Hamlyn Blue boards. No Inscriptions, a small bump at spine ends, tiny stain to a corner. 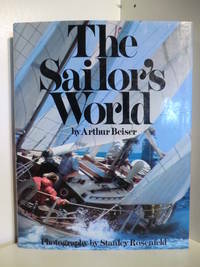 Contains many photographs. . First Edition. Hard Cover. Very Good/No Jacket. 4to - over 9¾" - 12" tall. A Ridge Press Book - Random House n.d.. sm. 4to. Hardcover in d/w. 251pp. Illustrated throughout with colour and b&w photos. .